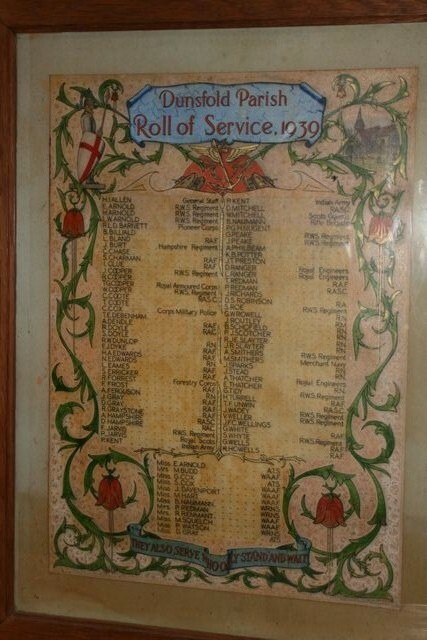 attached to 2nd/7th Battalion, The Sherwood Foresters (Nottinghamshire and Derbyshire Regiment), 178 Brigade, 59th (2nd North Midland) Division. He was awarded a Silver War Badge on 28 December 1916 indicating that he was no longer medically able to serve in the Forces but it is not known what the problem was or how it happened. His ship, HMS Canada joined 4th Battle Squadron, Grand Fleet in October 1915. She was present at the Battle of Jutland in 1916 and fired 42 14inch rounds and received no damage. The following June she transferred to 1st Battle Squadron but does not appear to have been in action. 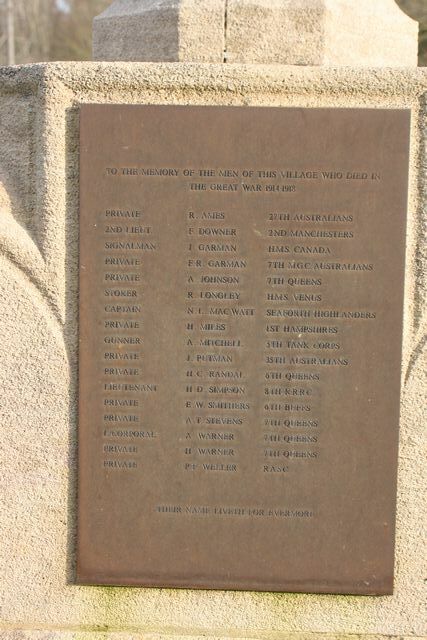 the husband of Evelyn A Garman of Kilcoy, Queensland, Australia. His ship, HMS Venus was part of 11th Cruiser Squadron and had, in October 1914, captured two German merchant ships. Then she had sailed in 1915 to the Red Sea and Persian Gulf and in 1916 to China. It does not appear that she was engaged in action. Lieutenant, 2nd Battalion, Seaforth Highlanders (Ross-shire Buffs, The Duke of Albany’s), 10 Brigade, 4th Division. He was the son of Norman MacWatt of Alloa. Probate was granted in February 1917. His address is given as Shorncliffe. 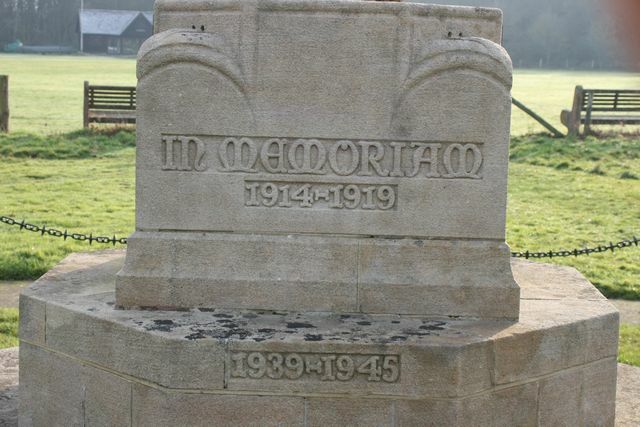 He was the husband of Edith Mitchell, River View, Loxwood. He was born in Dunsfold. Wolmer Cottages, Blackmoor, Petersfield and of the late James L Putman. Lieutenant, 8th (Service) Battalion, The King's Royal Rifle Corps, 41 Brigade, 14th (Light) Division. He was the son of the Rev. Robert H B and Sophia J Simpson, Whinfield, Longdown Road, Guildford. He was a Scholar at Charterhouse and an Exhibitioner at Magdalene College, Cambridge. 7th Royal Tank Regiment losses were mounting steadily, including Major Coombs commanding A Squadron who received a head injury. At 17.00 hours General Richard O'Connor arrived on his motor bike and immediately assessing that 7th Royal Tank Regiment was facing the main enemy counter attack he brought down "every gun in Normandy" - over 700 pieces of carefully husbanded artillery. "the ridge in front of us dissolved into dust – Adolf Hitler Panzer Division and all". The German advance was checked. Gaisford played a "fine part" in the action. On 8 July General O'Connor made a fresh attempt to reach the Orne - Operation Jupiter. The 7th was always in the van of the attack and was heavily engaged. The regiment had four officers killed and lost eight tanks but claimed nine panzers. The CO was blinded in one eye but refused to leave the field until dusk. Major Robert Fleming, the 2 i/c was killed. 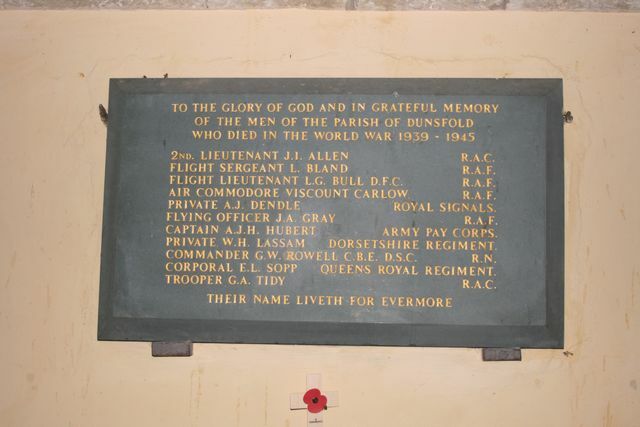 He was the son of Leonard and Ivy E Bland of Dunsfold. His death is recorded in the civil registers so it is probable that he died from his war injuries. Johnny Bull took part in the “Great Escape” from Stalag Luft III. A factual history is recorded by Paul Brickhill in his book “The Great Escape”. 76 prisoners escaped but 73 were recaptured. No less than 50 were shot on the direct and personal orders of Adolf Hitler. He was killed when his aeroplane, Warwick BV247 of 525 Squadron, exploded and crashed into the sea near Newquay, Cornwall whilst flying to visit Marshall Tito in Yugoslavia. He died on 7 March 1941. He was 54. 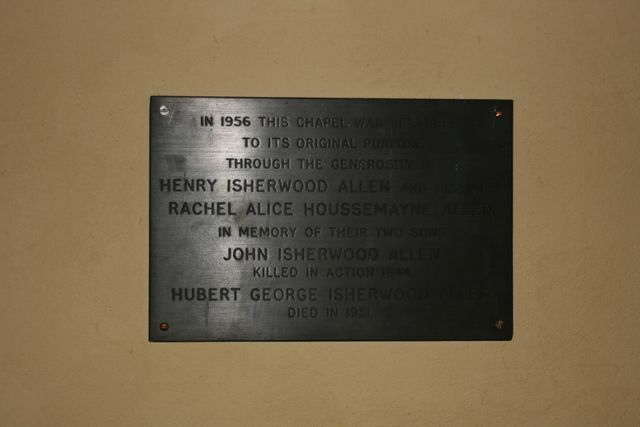 He was the husband of Norah W Hubert of Salisbury. He died in Lancashire. 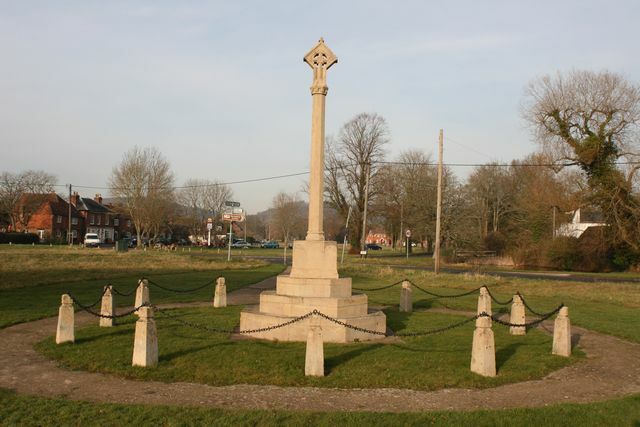 Probate records show that he lived at The Rough, Chiddingfold and that he died on war service. The first amphibious assault by the Allies was the invasion of Sicily on 9 July 1943. 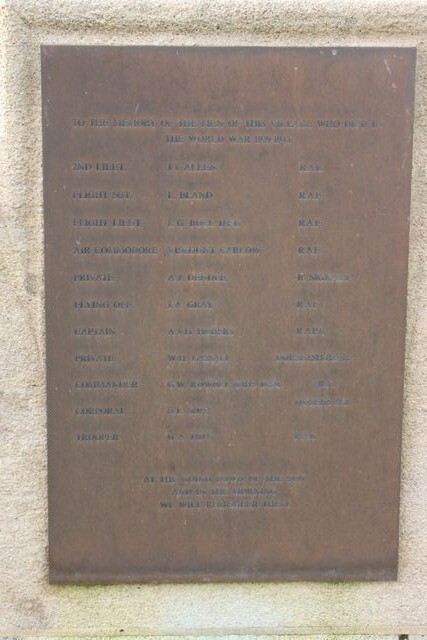 There is no birth registered for the initials W H as appears on the War Memorial but there is a William Thomas Lassam born in 1912 and this has been presumed to be the appropriate man. He was the husband of Daphne Rowell of Farnham Royal, Buckinghamshire. the war. It was later to be the first base used by Alan Bristow. He was the son of George and Phyllis Sopp and the husband of Hilda E Sopp of Dunsfold. Armoured Divisions. This attack was succeeded in taking the Ridge, but marked the beginning of a week of the heaviest fighting experienced since Monte Cassino with daily losses for the 8th Army of some 150 killed. Trooper, GHQ Liaison Regiment, Royal Armoured Corps. He was the son of William D and Agnes Tidy of Dunsfold. 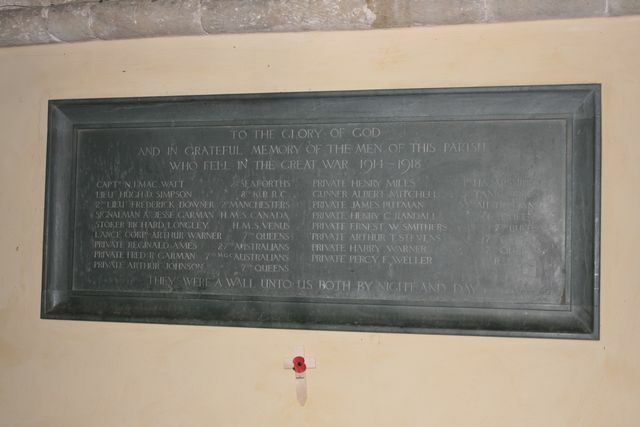 He is buried in plot R, grave 16 in the churchyard of St Mary and All Saints, Dunsfold. he had probably been invalided out of the Army.